Edward Tucker has told us that Landroverman of Taunton had a Land Rover Defender stolen from premises in Taunton, Somerset over the Easter weekend and is offering a reward for its return. 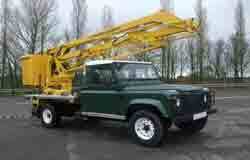 The stolen vehicle is a 2003, 130 Land Rover Defender Td5 fitted with a Syltone Cherry Picker Access platform. There is a £2000 cash reward for its return. Normal conditions apply. If anyone has any information please could they telephone Landroverman on 01823 412530 or email sales@landroverman.com.